We have officially been tracking our net worth for 2 years now! Our net worth has grown by 24.5% since our first report back in March, 2015! That is an increase of over $100,000 in just 2 years. It is an awesome feeling knowing we are growing our net worth by $50K per year! Over the past 2 years … we have started to see our assets really grow, while at the same time most of our liabilities decrease. Keep widening that gap (difference between liabilities and assets) so that more money can be used to buy assets and less money to pay for liabilities. 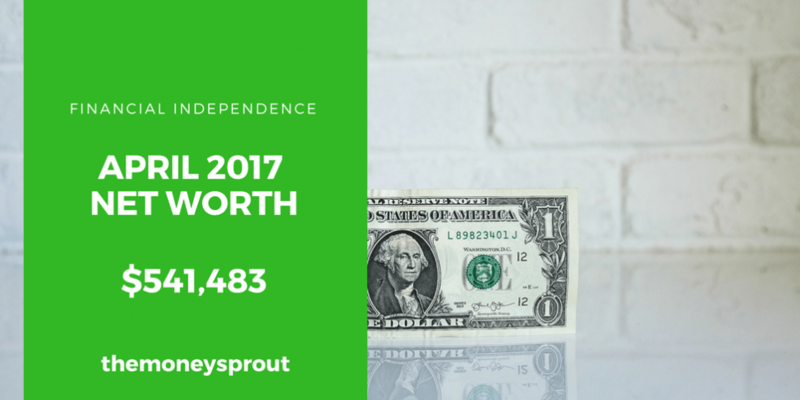 As of April 25th, 2017 – our net worth is $541,483.41! Here is our most recent update, compared to our last net worth post in March. Our net worth in April 2017 increased by an amazing 2.6% compared to March (2017). That is an increase of over $13,000+ in just 1 month. This month, the the majority of the increase was from our investments as a result of a bullish stock market. In addition … we were able to decrease our liabilities at a decent rate and we got our tax refund – both of which helped boost our net worth. Investment increases made up the majority of our overall net worth increase last month. We invested close to $5,000 from our tax refund into stocks which accounts for about half of the $10K increase. The other investment increases were a result of the bullish stock market and our investments growing overtime. The value of our investments rose by 2.62%. We were able to bump our cash balance up this month after letting it drop a lot in March. I like to keep a balance of $4,000 to $5,000 in our cash accounts and the rest gets invested. A nice increase in our home value … although it doesn’t really mean a whole lot at this point. Overall, all 3 of our assets that we report on saw increases. Investments really helped skyrocket our net worth this past month! Total assets rose by almost 1.63% since last reporting. The balance on both of these loans should drop a decent percentage each month going forward … especially loan #2 since it is 100% principal. And we have started paying extra on car loan #1 just to get it off the books. We also saw a good drop in our car loan debt as well as our credit card spending. Look at how much our liabilities dropped in just one month! That is basically the equivalent of a mortgage payment for us. I never like to see our liabilities increase. Over the last month, we have lowered our liabilities by (0.73)% … which is a good thing. As I like to point out every time we talk about net worth … there are 2 sides to the equation. So a decrease in liabilities by ~$1,500+ is just as important as increasing our assets by the same amount. In fact … I actually get more excited now reporting on how we are lowering our liabilities instead of growing our assets. After reviewing our net worth number for this April, it is clear to see where our huge gains were made … investments. But that doesn’t tell the whole story. We were able to lower our liabilities by over $1,500 which I think is awesome. If we were able to maintain that rate every month, we could increase our net worth by $18,000 for the year! And besides lowering our debt, we were able to save a little more money last month and bump our cash balance up. Plus the estimated value of our home increased a bit … although we don’t get that excited about those numbers.